Fort Point Boston Blog: Hearing for Liquor License for 283 Summer St.
A restaurant group has applied for a liquor license for 283 Summer St. under the name "Pappa Gallo". 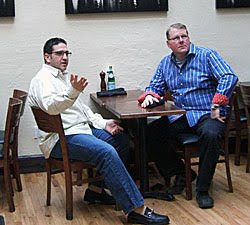 The group is called the 'Legendary Restaurant Group' and is owned by Brad Dalbeck and Chris Damian. They currently run Scollay Square, Tavern on the Water, and Max and Dylans.